We are a distributor of OUCH! products. Australia’s first certified organic sting relief spray. 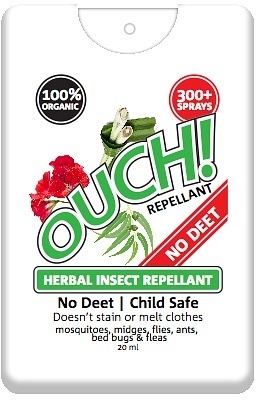 Ouch spray is made from pure herbs and unlike other sting relief products on the market Ouch Spray is free from nasty chemicals making it perfectly safe to use on young children. Ouch Sting Spray is not tested on animals and is endorsed by Choose Cruelty Free. 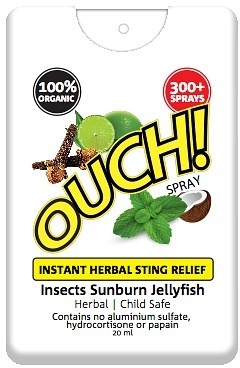 Ouch Spray is the only sting relief product that washes residual marine and insect venom from the skin, and will give instant relief to stings, instantly cooling and numbing the area. This credit card sized spray easily fits into your pocket and contains an amazing 300 applications. Click here to buy OUCH! online.